Being able to breathe underwater and explore the vast depths of the oceans without having to fear all those crushed-by-the-pressure problems is probably among one of the greatest fantasies that humans possess. No wonder we're so jealous of mermaids and their aquatic freedom. Then again, half of our stories about them all involve the mythological merfolk wanting to walk around in our world, instead. Perhaps there's something to that whole bluer on the other side of the ocean thing. Still, trading in the flashy fins seems like a rough trade. 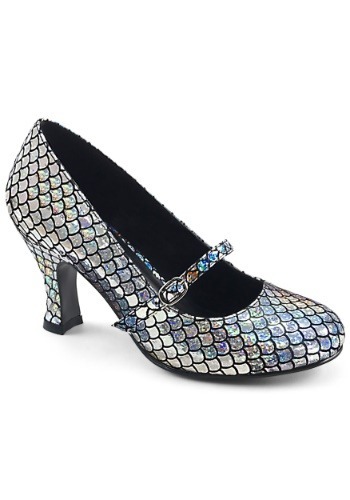 If you're a mermaid who is looking to prance around on a pair of legs, you can at least keep some of that aquatic style with these Silver Mermaid Heels. These faux leather shoes have a comfortable sole and raised heel for height, though the thing that makes them magic is the reflective scale pattern that'll look just magical. Remember to keep your magical look while treading through the surface world instead of treading water. With these Mermaid Heels, you'll be able to keep kicking that mermaid look even if you've given up the mermaid tail. Who knows, perhaps you can do both at once! ?